This year’s Powwow will honor the memory of the late Spike Draper (at left with black hat), the Powwow’s arena director of many years, as well as champion rodeo rider and fancy dancer. When you think Powwow, you generally think colorful costumes, rhythmic beats, and time honored traditions. 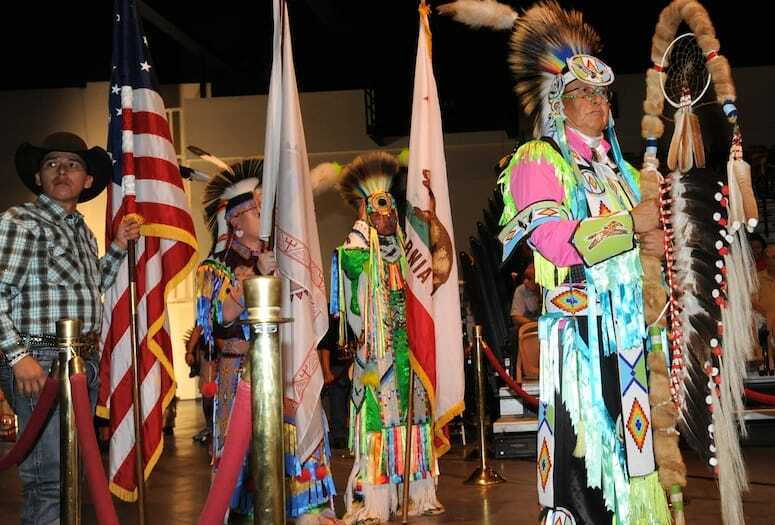 For the Cahuilla Indians (The Cabazon Band of Mission Indians), it’s more than a celebration that offers up grand performances with monetary prizes. It’s symbolic meaning pays homage to a way of life, a passing down of cultural traditions, an opportunity to give thanks and praise to the creation of its people and their historic roots. Bird Singers wear their own custom made Ribbon Shirts to express their performance style through the Powwow culture. The traditional bird song is a call for a social gathering does not have ceremonial clothing. Hence, the social bird song and dance were created and shared each year at community celebrations like the Indian Powwows. The performance serves to educate, and remind of the life struggles encountered by its people through poetic dance and song. The Bird Singer’s role is to bring magic to that time in history. “We take a moment and we make it great – that’s what a singer is called for,” Mirelez says. The women of the tribe are the Bird Dancers, they dance in unison with their male bird signers. Together, they recreate the struggles of their people throughout history and into current times. Each rattle is hand crafted from the gourd plant, the handle from cottonwood, and the inside is filled with palm seeds. Each rattle is creatively designed by it’s Bird Singer, the color and design of each rattle possess symbolic meaning and value.